We are so proud to announce that NAMMBA has recognized three DML Branch Managers in this year’s Top 100 list! 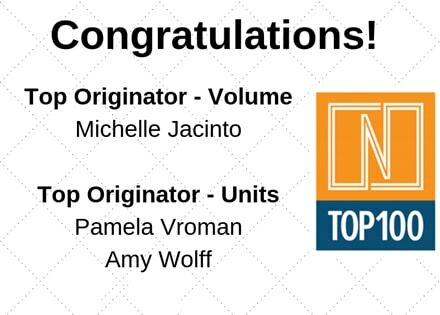 Congratulations to Top Originator for Volume, Michelle Jacinto, and Top Originators for Units, Amy Wolff and Pamela Vroman. Thank you for your hard work and dedication. We are all so proud of the service you provide to your clients and that you are on Team DML! We have posted the news to social media and we encourage you to share! Twitter: Visit our profile @DirectMortgage2 and you will see the post pinned to the top of our profile. Instagram: Visit our profile, @DirectMortgageLoans. The post is at the top of our feed. Once again, congratulations Michelle, Pam & Amy!